Look Now may lack some sentimentality, but Elvis Costello does return to familiar ground. 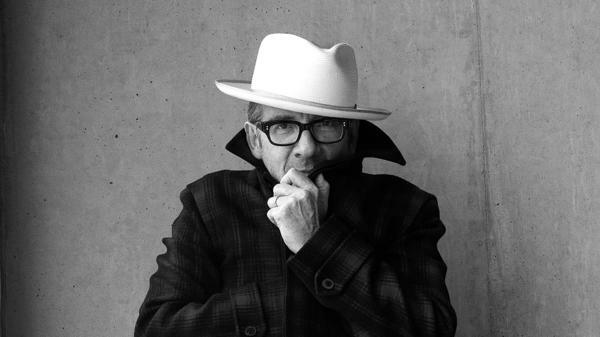 For 20 years, Elvis Costello has wanted to make what he calls an uptown pop record with a little swagger. With his latest album, Look Now, out Oct. 12, Costello has done just that by adding unusual combinations of horns and small string groups to his sound. Costello of course has been around for decades, but one thing he didn't want to make was an album that says, "Remember this guy?" "It's immediately a bad proposition," Costello says. "But unfortunately, that's a lot of the way both record companies and music magazines run the nostalgia business." Look Now may lack an obvious nostalgia factor, but Costello does return to familiar ground — songs full of rich characters loaded with desire and heartache. One song in particular, "Stripping Paper," exhibits Costello's storytelling prowess. As the song describes, a woman discovers the unfaithful nature of her husband. As a reaction, she tears away a layer of wallpaper in their house to discover the pencil mark on the wall where their daughter was measured — a fleeting symbol of when the couple was happy. "I'm not trying to tell everybody what every line is supposed to mean, because everybody will hear it differently," Costello says. "I think, particularly with these songs, they're not songs of judgments at all. They just tell the story and you take out of it what you take out of it, depending on your own experience." There are other nods to Costello's previous work on Look Now — most notably the return of a character named Jimmie, who first appeared in 2010 on Costello's album National Ransom. "Jimmie Standing in the Rain" told the story of an unsuccessful vaudeville singer, left abandoned at a railway station. It seemed that fans would never hear of Jimmie again, but he now makes a return performance in the song "Under Lime." "I just decided that he would be found, maybe in semi-obscurity," Costello says of bringing Jimmie back. "One of the things about popular music ... is that you smuggle sometimes quite dark ideas past the listener with a bright tune. I truthfully, originally sent this story to a very much more steady and ballad-like tune, and then I realized that it telegraphed the intentions of the song too much." Much like the sunny deception of his music, Costello was thrown a curve ball this past summer. As he was putting the finishing touches on this album, Costello's doctors found a potentially cancerous malignancy. The musician had to have surgery and cancelled some of his concerts in July as a result. "Challenges come up in life and you just have to be grateful for the opportunity to do your work the best you can," he says. "And I'm very thankful for the good wishes I received."